Most of this report has focused on the characteristics, attitudes and experiences of the U.S. Jewish population, defined as Jews by religion and Jews of no religion. The survey also interviewed people who have a connection to Jews or Judaism but who have not been categorized as Jewish in this report. These respondents have been categorized into two groups, people of Jewish background and people with a Jewish affinity. As the name suggests, people with a Jewish background were all raised Jewish or had a Jewish parent. But they have not been included among the Jewish population in this report because they all say either that they are not Jewish or that they are affiliated with a religion other than Judaism (e.g., Christianity). All people in the Jewish affinity category describe themselves as Jewish or partially Jewish. But they have not been included among the Jewish population in this report because no one in this group is exclusively Jewish by religion – though a few describe their religion as both Judaism and something else, usually Christianity – and no one in this group was raised Jewish or had a Jewish parent. Though they have not been included in the Jewish population in the analyses contained throughout most of this report, these are interesting groups in their own right. Thus, this chapter examines their responses on a number of the survey’s key questions. 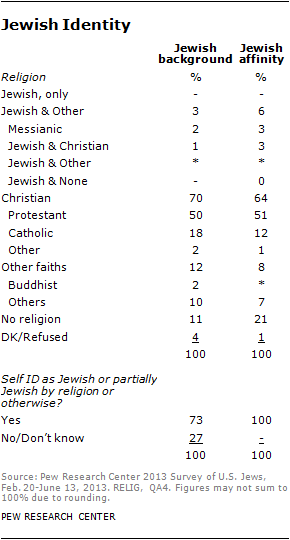 Most respondents in the Jewish background and Jewish affinity categories are Christians, religiously speaking. Indeed, many of them – especially those in the Jewish affinity group – say they think of themselves as Jewish precisely because of their Christianity (e.g., because Jesus was Jewish). Overall, people in the Jewish background and Jewish affinity categories tend to be more religious than both Jews by religion and Jews of no religion. But compared with Jews by religion, those in the Jewish background and Jewish affinity categories are substantially less involved in Jewish organizations and the Jewish community, and are less likely to participate in uniquely Jewish rituals and practices. Interestingly, Jews of no religion – who are a part of the overall Jewish population analyzed throughout this report – also are far less involved in Jewish institutions and practices than are Jews by religion. On these measures, Jews of no religion have more in common with people of Jewish background and Jewish affinity than with Jews by religion. By definition, everyone in the Jewish background category was raised Jewish or had a Jewish parent. Having this kind of Jewish background is the key attribute that holds this category together. But why are these respondents not categorized as Jewish in the analyses contained in this report? The reason for treating them separately from the Jewish population is that everyone in the Jewish background category either says they are not Jewish (by religion or otherwise) or espouses a religion other than (or in addition to) Judaism. Most people in the Jewish background category (70%) are Christians, religiously speaking, including half who are Protestant, 18% who are Catholic, and smaller numbers from other Christian groups. About one-in-ten people in the Jewish background category (11%) say they have no religion; all of them say they do not consider themselves Jewish or partially Jewish aside from religion. Everyone in the Jewish affinity category describes themselves as at least partially Jewish. But no one in the Jewish affinity category describes themselves as exclusively Jewish by religion; if they had, they would have been in the Jewish by religion category. And no one in the Jewish affinity category was raised Jewish or had a Jewish parent; if they had, they would be in the Jews of no religion category (if they are religiously unaffiliated) or the Jewish background category (if they are religiously affiliated). As with the Jewish background category, the largest religious group represented among those with a Jewish affinity is Christianity (64%). About one-in-five people (21%) with a Jewish affinity are religiously unaffiliated, and 6% describe their religion as Judaism and something else, including 3% who are Messianic Jews. As mentioned, 100% of those in the Jewish background category were raised Jewish or had a Jewish parent. One-fifth of those with a Jewish background were raised Jewish by religion, and 46% were raised Jewish aside from religion. Nearly nine-in-ten (87%) had a Jewish parent. Most respondents in the Jewish background category say that, religiously speaking, they were raised as Christians (58%). By definition, no one in the Jewish affinity group was raised Jewish (by religion or otherwise) or had a Jewish parent. Nearly nine-in-ten of those with a Jewish affinity (86%) say they were raised as Christians. 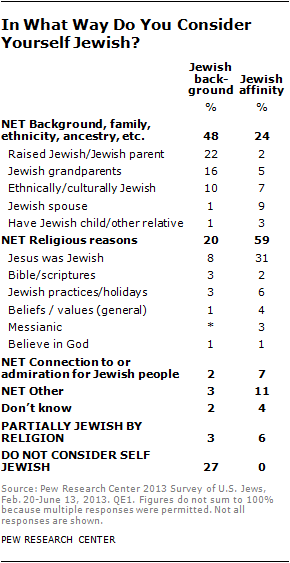 Among those with a Jewish background, the most commonly offered responses (48%) mentioned an ancestral or familial connection. This includes 22% who volunteered that they were raised Jewish or have a Jewish parent, 16% who say they have Jewish grandparents, and 10% who consider themselves ethnically or culturally Jewish. One-in-five people with a Jewish background (20%) say they consider themselves Jewish for religious reasons, including 8% who say they are Jewish because Jesus was Jewish. Roughly one-in-three respondents in the Jewish background category either do not think of themselves as Jewish (27%) or identify as partially Jewish by religion (3%), and thus were not asked this question. Among those in the Jewish affinity category the most common response is that they think of themselves as Jewish for religious reasons (59%). This includes 31% who say they are Jewish because Jesus was Jewish. Smaller portions consider themselves Jewish because they observe Jewish practices and holidays (6%) or have shared beliefs and values (4%). About a quarter of those in the Jewish affinity group say they consider themselves Jewish because of an ancestral or familial connection. This includes 9% who say they have a Jewish spouse, 7% who say they are ethnically or culturally Jewish, and 5% who volunteer that they have a Jewish grandparent. A few (2%) even volunteer they were raised Jewish or had a Jewish parent, even though their answers to the closed-ended questions used to define analytical categories indicate they were not raised Jewish and did not have a Jewish parent. People with a Jewish background tend to be younger than Jews by religion but older than Jews of no religion; more than half of those in the Jewish background category are under age 50 (55%), compared with 45% of Jews by religion and 61% of Jews of no religion. The Jewish affinity population is an older group, resembling Jews by religion. Most of those with a Jewish affinity are 50 or older. Respondents in the Jewish background and Jewish affinity categories have lower levels of educational attainment and lower household incomes compared with Jews. Nearly four-in-ten (37%) of those with a Jewish background are college graduates, as are a quarter (24%) of those with Jewish affinity. By contrast, half or more of Jews of no religion (53%) and Jews by religion (60%) have college degrees. And whereas a plurality of Jews by religion (44%) and 37% of Jews of no religion have household incomes of $100,000 or more, just 21% of people with a Jewish background and the same percentage (21%) of those with a Jewish affinity earn this much. In their marital status, respondents with a Jewish background and those with a Jewish affinity roughly resemble Jews of no religion; all three groups are less likely to be married and far less likely to be married to a Jewish spouse as compared with Jews by religion. Compared with Jews by religion, people with a Jewish background and those with a Jewish affinity are far less involved with Jewish institutions and less connected with the Jewish community. But interestingly, they are no less involved than Jews of no religion. About one-in-ten of those with a Jewish background say they belong to a synagogue (5%) or that someone else in their home does (5%). Just 4% of those with a Jewish affinity live in a household where someone is a member of a synagogue. These levels of organizational involvement roughly match those seen among Jews of no religion, and pale in comparison with Jews by religion. The same pattern holds true for having made a donation to a Jewish charity or cause. In 2012 about one-in-three of those with a Jewish background (28%) made a financial donation to a Jewish charity, slightly more than the percentage of Jews of no religion who donated (20%). A quarter of those with a Jewish affinity also contributed financially to a Jewish charity in 2012. At the other end of the spectrum, two-thirds of Jews by religion donated to a Jewish charity in 2012. One-in-ten Americans with a Jewish background (11%) and with a Jewish affinity (9%) say that all or most of their close friends are Jewish. Among Jews of no religion, 14% say the same. By contrast, roughly four-in-ten of Jews by religion (38%) say that all or most of their close friends are Jewish. On several measures, people of Jewish background and those with a Jewish affinity are significantly more religious than Jews of no religion and Jews by religion. But those of Jewish background and Jewish affinity are significantly less likely than Jews by religion to participate in specifically Jewish religious practices. Roughly six-in-ten respondents with a Jewish affinity (62%) and of Jewish background (58%) say religion is very important in their lives, compared with 31% of Jews by religion and just 8% of Jews of no religion. Those of Jewish background and Jewish affinity also are far more likely to say they are absolutely sure God exists (72% and 81%, respectively) as compared with both Jews by religion (39%) and Jews of no religion (18%). But most respondents in the Jewish background and Jewish affinity categories say they seldom or never attend Jewish religious services. Most also say they did not participate in a Seder last Passover, and most did not fast on Yom Kippur in 2012. Many Jews of no religion also report low levels of participation in these kinds of uniquely Jewish practices. Jews by religion are much more likely than all three other groups to say they participate in these rituals and traditions. Most respondents of Jewish background and Jewish affinity attend non-Jewish services at least a few times a year (58% and 57%, respectively) while only 15% of Jews do so. Similarly, roughly six-in-ten people of Jewish background (61%) and people with a Jewish affinity (60%) say they had a Christmas tree in their home last year, compared with 27% of Jews by religion and 51% Jews of no religion. The majority of people of Jewish background and people with a Jewish affinity say that someone can be Jewish even if they believe Jesus was the messiah. By comparison, three-in-ten Jews by religion (30%) and about half of Jews of no religion (47%) believe this. Roughly one-fifth of respondents of Jewish background (21%) and one-quarter of those with a Jewish affinity (26%) say they feel very emotionally attached to Israel. This exceeds the degree of attachment to Israel expressed by Jews of no religion (12%) but falls short of that seen among Jews by religion (36%). Those of Jewish background and Jewish affinity also are more likely than Jews of no religion to say that the U.S. is not sufficiently supportive of Israel (37% and 41%, respectively, vs. 17% among Jews of no religion). But those in the Jewish background and Jewish affinity categories are less likely than both Jews by religion and Jews of no religion to have visited Israel. Among those of Jewish background, 13% have visited the Jewish state, as have 9% of those with a Jewish affinity. By comparison, about a quarter of Jews of no religion (23%) and half of Jews by religion (49%) say they have been to Israel. Compared with Jews, those in the Jewish background and Jewish affinity categories are more politically conservative and Republican or Republican leaning. About four-in-ten of those with a Jewish affinity (42%) say they are Republican or lean toward the GOP, as do 37% of those with a Jewish background. By contrast, just 24% of Jews by religion and 12% of Jews of no religion identify with the GOP over the Democratic Party. Similarly, roughly four-in-ten of those of Jewish background (37%) and Jewish affinity (41%) describe themselves as politically conservative. Just 22% of Jews by religion and 11% of Jews of no religion say the same. Respondents in the Jewish background and Jewish affinity categories are also more likely than Jews by religion and Jews of no religion to express disapproval of Obama’s performance as president. The same broad patterns apply to political issues. People of Jewish background and Jewish affinity are more inclined than Jews to say they prefer a smaller government that provides fewer services, rather than a larger government that provides more services. They also are more likely to say that homosexuality should be discouraged by society.